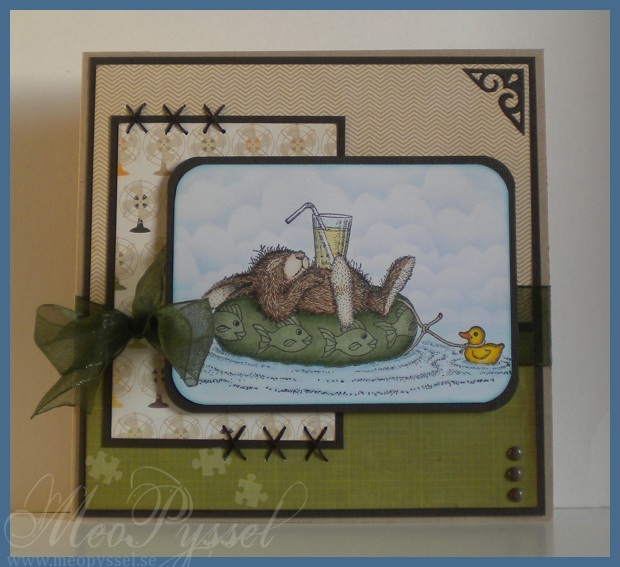 So I sat down last weekend to work a bit more with my dragon and believe it or not I have finished a card. I have to say that work-stress and good friends are a good craftingforce. After a hard week i sat down to get my head off work and I looked at the dragon and thought – who would I like to make a dragon to and the answer was obvious: Eva. So with her in mind I made this card to let her know that I’m thinking of her and that she is very special to me. I keep with the blue and red theme and I think these flower matches beautifully with the ones on the stamp so I used only them as an embellishment. The inside is following the same theme but much more simple as usual. I did put some flowers there even if the card gets bulkier but I really wanted them there and the envelope is big enough to handle it. On a completely different subject- I just ordered a new camera so soon my pictures will be much better (as seen here but I’m still learning), and hopefully I’ll start taking more photos and making some albums:) I have been dying to try Project life. I can’t wait! 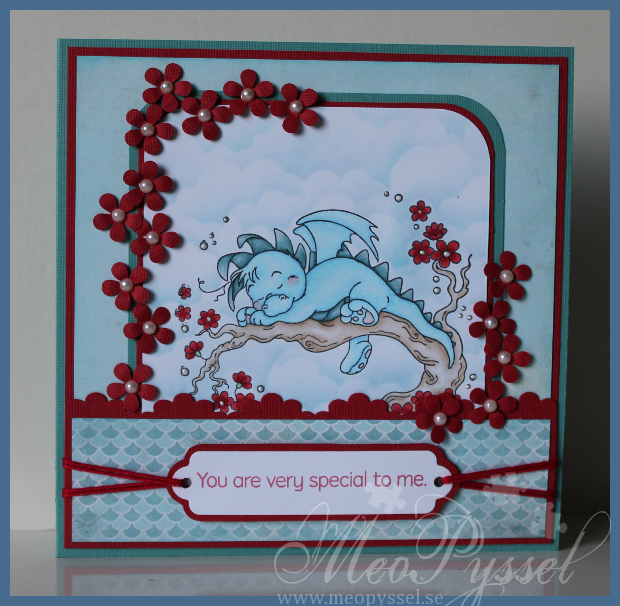 Stamp: Wee – Dreamy Dragon. Hero Arts – Sending Smiles Messages. Dies/punches: Spellbinders – shapeabilities – double ended tags. 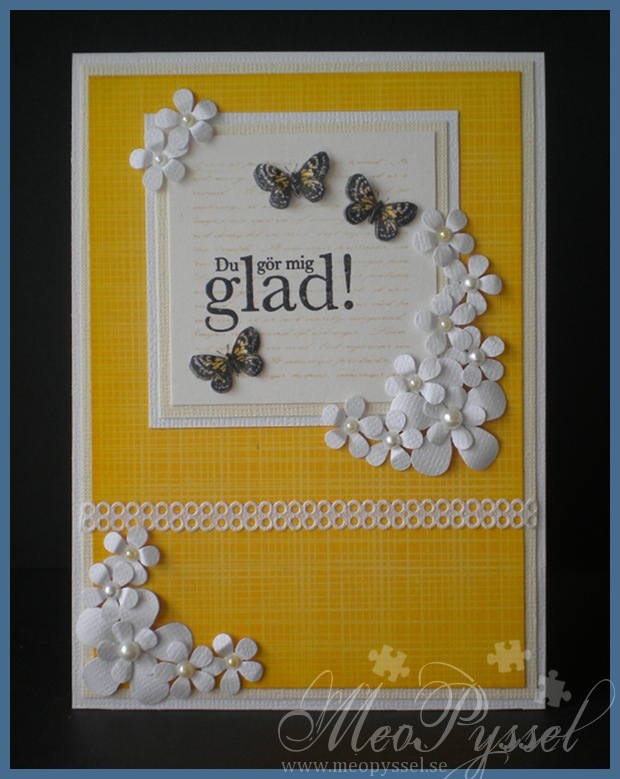 EK Success – Large Corner rounder, small retro flower. 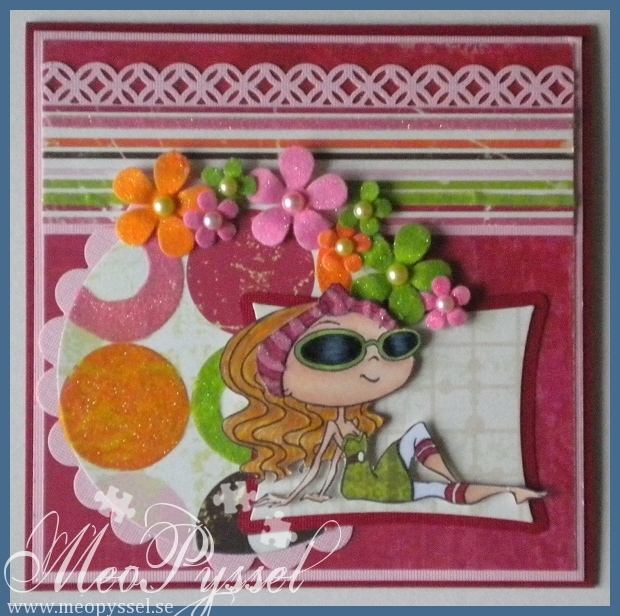 This weeks challenge over at the Sweet Stampin’ is Flower Power and our lovely sponsors for this week is My Favourite Things that will give a $25 gift certificate for a lucky winner. Our monthly sponsors is Joanna Sheen with a £10 voucher. So I have to admit that this card is made in a hast. I have had a full week and the next wont be better from what i can see. So i wanted to use this adorable stamp from Lili of the valley that I got the other day. I did have a really nice time color it, the only think I’m a bit annoyed with it the Pansies, especially the leaves but hopefully I will do it better next time. I bought this stamp with my mom in mind and i have to make a card for her soon but this ons is actually for my grandmother as a thank-you for the wedding-gift me and Bjorn received a few days ago. The papers are from Basic Gray’s collection Hello luscious, the yellow button is also from that collection, and the flowers are a punch from EK success. I have to say that I’m not very happy with the card, there is something off but I’m to tiered to see or fix it and the good thing with Grandparents is that they love all you do! Dies/punches: Spellbinders – Nestabilities, Large normal and scalloped rectangles, Large and small Circle. My Favourite Things – File Tab. EK Success – Daisy small. 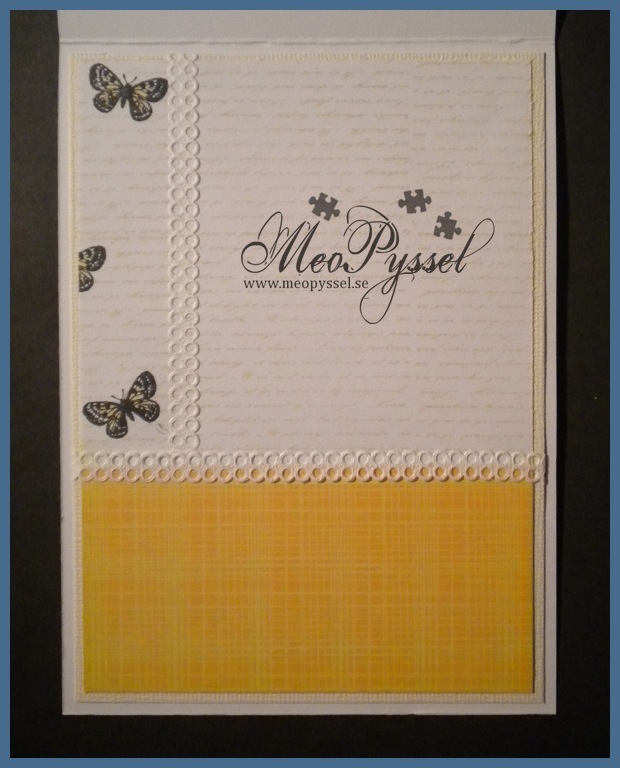 So i just made the first card in 2012, whoho! The card is for an old high scool-friend that turns 25 next week. 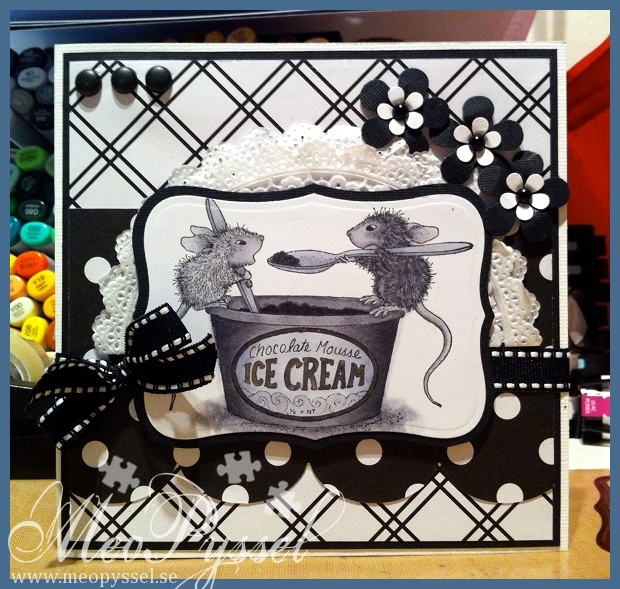 I have no idea what colors she like and i knew House Mouse had a black and white challnge i thought it would be perfect. 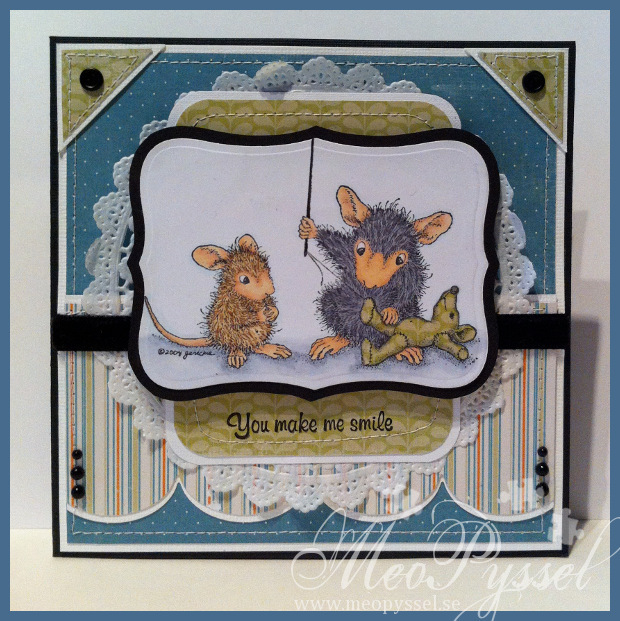 The mice i colored with mostly neutral grays and some addition of cold grays. I really like how the darker mice’s fur turned out, the light one was hard to get the texture without making it darker so i kept it as i was. The edge of the ice cream-label and the text is also painted with some sakura stardust-pen, it’s a bit hard to see on the picture but you can see that it do have another shade then the rest. The papers that is used is of an unknown brand, I did buy a couple of sheets as a pack but they came as loose papers. If anyone recognize them please tell me. The scalloped edge is made with Jumbo Scalloped from My Favorite Things. 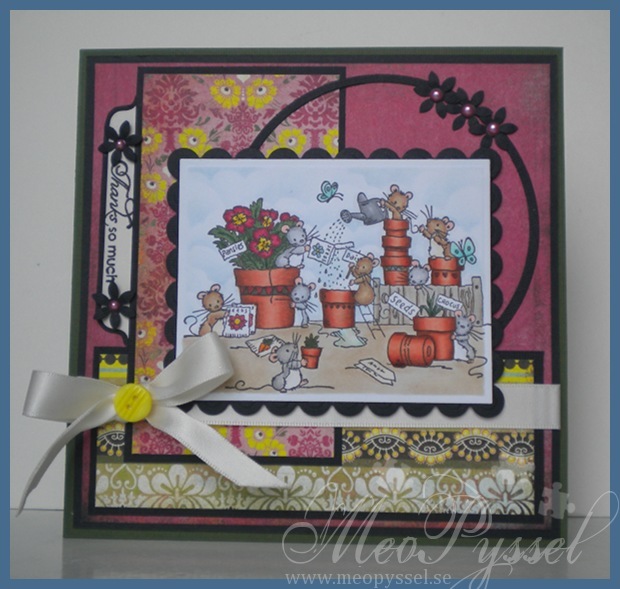 The flowers are made with EK Sucess’ Medium retro Flower and Flowerpower punch. I also used some doilies and they are my forgotten item for this card. A long time ago i bought a lot of dodilies from Panduro but they apparently ended up in the bottom of my paperstash, because that were i found them when i went into the wardrobe and for my hidden-away-papers. But the most exciting is the brads! Some days ago i got a nice package home in in mailbox containing We R Memory Keepers Brad Setter and Piercing Tool. I ordered it when Amy recommended it with the comment that it might seem like a waster but that once you use it you’ll love it. I always get annoyed that my brads don’t line up due to the fact that when i open the legs they get uneven. And after using it on this card I just have to say: I LOVE IT! It’s simple, saves my fingers from getting the bradlegs under my nails, and the brads get straight- so simple and just wonderful! 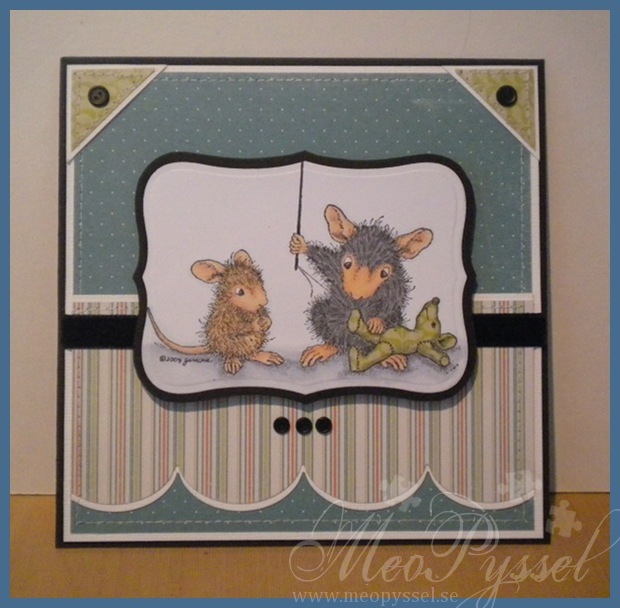 So I’m done with the last House Mouse and hamster card of the order. 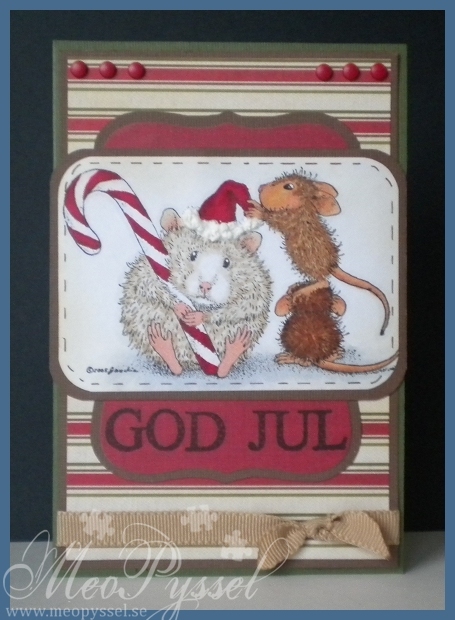 This one is a more old-fashioned one and I wanted a white hamster on this one. I really like how the hamster turned out but i do think the mice look a bit tan beside him or her so if i had colored the hamster first i would probably have gone with a lighter skin-combo for the mice. The papers are, as on the other two cards, from DCWV’s The Christmas Combo pack. 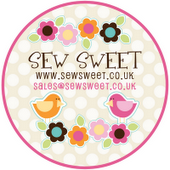 So now i will head over to the next part of the order that will be featuring some Penny Black stamps…. Other: Spellbinder’s Label 8. Antique Linnen Distress ink. EK Succcess’ medium corner punch. Todays card is one that i made pieces of being a bit sick so excuse the lack of details. 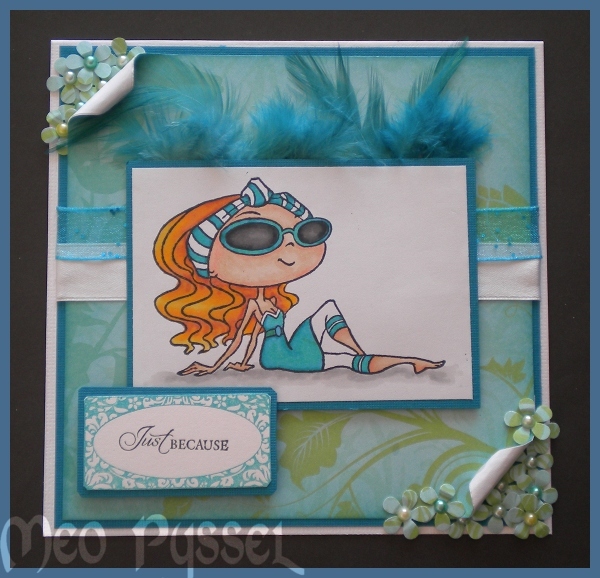 The image is Kraftin’ Kimmie’s Florance and the is colored with Promarkers and Copics. As an afterthought i think that the focal is a bit empty and boring and i wish i would have distressed or drawn a frame for her. 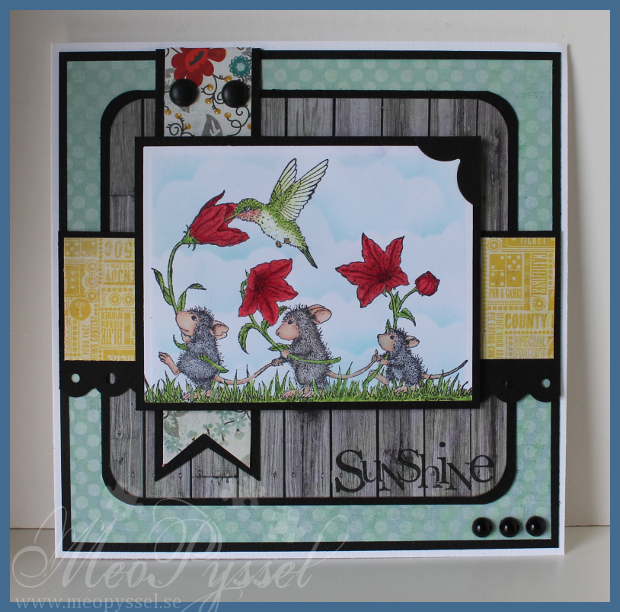 The Greeting and it’s frame is both Gina K’s Fanciful tags and the frame was stamped with Versa Colors 20 Turquoise. The flowers coming of the corners is the thing im most satisfied with and they are made with EK Success Flower Power punch. I added a medium peal into every one in a couple of different colors. The background paper is from an very old paper pack that i don’t know the name of brand of. 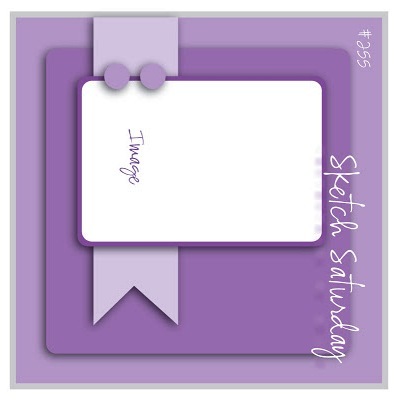 I used Sketch Saturday for the layout. The top block is made from feathers i found in my stash, i think they are form a jewelry kit from Panduro, but I’m not entirely sure.